MANOR HALL® Interior Semi-Gloss Acrylic Latex. 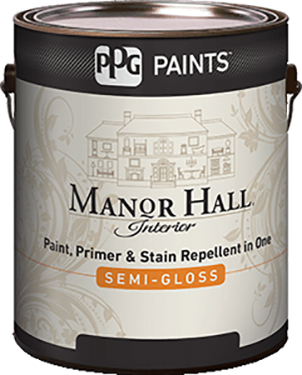 Manor Hall Interior Paint, Primer & Stain Repellent in One is a super premium latex that was developed to resist household stains through the combination of resin and proprietary formulation. The 100% acrylic latex has outstanding adhesion and coverage and offers a burnish and mildew resistant coating, providing the durability for use in high humidity and high traffic areas. Outstanding hiding is aided by excellent flow and leveling which provides a rich, smooth film for a beautiful finish.